Maria (Cioci) Maiuri, 99, of Hudson, MA, passed away peacefully at home, on Monday, August 27, 2018, surrounded by her loving family. She joins her beloved husband, Pio Antonio Maiuri in heaven, who predeceased her in 1994. Maria was born on June 16, 1919 in Ceprano, Italy. The daughter of Giuseppe and Assunta (Grimaldi) Cioci. She immigrated to the United States in 1961 and helped support her family working as a machine operator at Thomas Taylor & Sons. 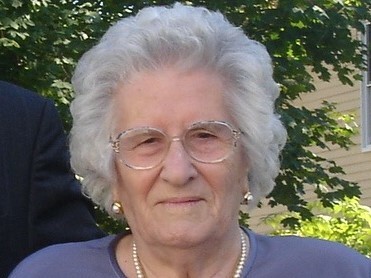 In her retirement she loved tending to her roses and garden, knitting, crocheting, and enjoying all her grandchildren. Maria was the matriarch of her adoring family. Over the holidays and on special occasions, Maria bonded the entire family together at her home with feasts of traditional Italian dishes straight from her kitchen. Maria is survived by her three children, all living in Hudson: Anna Parente, Rita Galuffo and her husband Anthony, and Angelo Maiuri and his wife Sandra. She also leaves 8 grandchildren: Emma, Daniela, Marco, and Sonny Parente; Jonathan and Robert Galuffo; and Stefano and Alessa Maiuri; and 14 great grandchildren plus many nieces and nephews. She is survived by her brother Ernesto Cioci, and predeceased by siblings: Teresa, Pietro, Annetta, Pasquale, Angela, Arduino, Filomena, Luigi and her son-in-law Santino Parente. Calling hours will be held from 4 p.m. until 7 p.m. on Friday, August 31, 2018, at TIGHE HAMILTON FUNERAL HOME, 50 Central St., Hudson, MA. On Saturday morning a funeral cortege will process to Saint Michael Parish, 21 Manning St., Hudson, for a 9 a.m. Mass of Christian Burial. Interment will be in Saint Michael cemetery in Hudson.